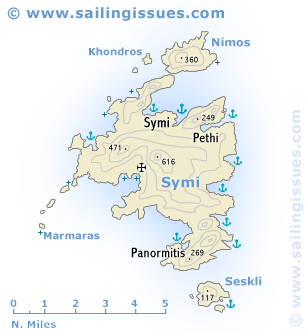 Symi island - Simi yachting guide, sailing holidays and yacht charters from Simi (Symi) island. ideal for a sailing holiday and according to Ho­mer it possessed eight good harbours. The inhabitants live of sponge-fishing and boat-building. The south side of Sesklion island has a small cove guarded by a rock; approach from the east to anchor in wonderful tranquil surroundings. The passage between Symi and Nimos islands is 3.5 m minimum, but is far less dangerous then one might expect. 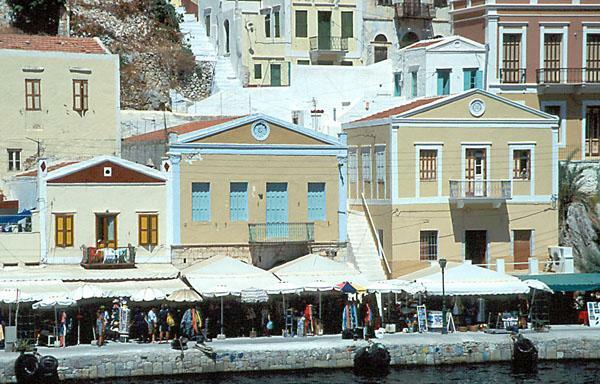 From ancient times the fortunes of Symi were closely linked with those of Rhodes. The island was occupied by the Turks in 1523 and after the Balkan War of 1912 was held by Italy. It was reunited with Greece in 1947. The island's capital Symi (or Yialos), with its handsome 18th and 19th c. mansions, lies on the north coast, in a bay sheltered by the little island of Nimos. 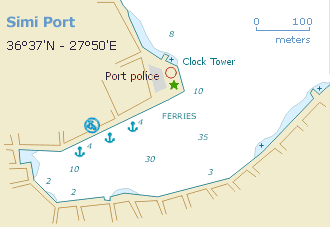 The clock tower on the edge of the harbour is easily identified. Moor stern-to the quay (see photo below), but it is paramount to leave the part of the quay allotted to the ferries clear. 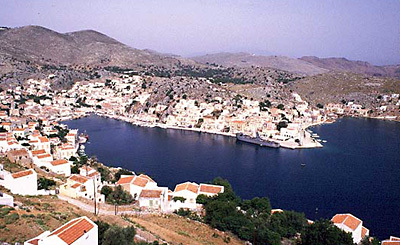 Symi port (Yiali) with its Venetian houses looking WNW. Moor at the north side in the middle of a charming boulevard. 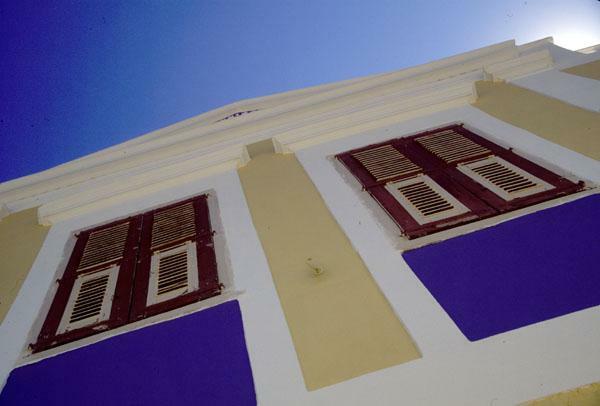 Few islands have Symi's crisp brightness and its amphitheatre ambiance of Neoclassical mansions, in soft ochre or traditional deep shades, stacked one on top of the other right up the barren hill sides. Our approach to the quay looking north. During the afternoon numerous ferries bring loads of tourist, but when these invaders depart, the sailing fraternity - flying flags from all nationalities - takes over, and the boulevard rejoices in a more gentil and relaxed air.